This paper introduces the ADMAG AXR 2-wire magnetic flomwmeter solution for chemical feed application. Cost reduction of supporting infrastructure by US$1,000 to $2,000 per unit. 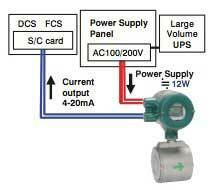 4-wire comparable stable and accurate process control to maximize the productivity. The chemical feed application is one of the common application in various industry, and the accurate and stable flow measurement is the key to optimize the process control, and the performance of plant operation. When the conductivity of the chemicals and main process is different, the injection brings sudden conductivity change and a non-uniform distribution of conductivity in the process. 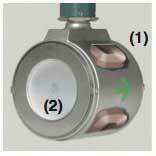 The measurement stability under the fluid condition change is very important factor to be applied in the control loop, and traditionally, 4-wire magnetic flow meter is applied for the flow measurement of control loop. Newly released 2-wire ADMAG AXR series delivers dual benefits, 4-wire comparable excellent performance and cost reduction of 2-wire system in various applications. 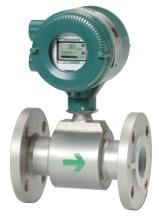 The ADMAG AXR is the world's first 2-wire magnetic flow meter which employs the unique "Dual Frequency Excitation Method*1), "achieving 0.5% of rate of best-in-class accuracy and excellent stability for process measurement. In addition, the newly developed AXR key technologies*2)," achieves the same level of noise immunity as 4-wire type under the fluid condition change and delivers enough performance to meet the requirement to apply in the control loop. The dual frequency method successfully combines the best properties of low frequency excitation enabling the stability in measurement, and high frequency excitation delivering excellent noise immunity. As a result, AXR can suppress process- generated noise securing zero stability without sacrificing fast response time. Yokogawa has developed a perfectly aligned "super high density" coil winding technique to maximize the S/N ratio. 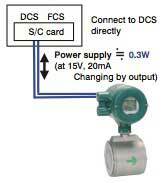 This new technology increased the number of coil turns by 1.5 times compared to 4-wire magemeters, and successfully increase the signal portion of S/N ratio. Rough lining surface is likely to generate turbulent flow near electrodes, which results in larger flow noise. AXR employs a mirror finished lining to ensure a smooth surface. It minimizes flow noise by reducing the flow turbulence. The salt injection test was conducted to simulate a chemical feed application. AXR is installed serially with AXF 4 wire-type, and the concentrated salt water was injected in tap water 6 times. Salt injection will bring a sudden conductivity change and a non-uniform distribution of conductivity in the process. The ADMAG dual frequency excitation method filtered out the noise spike generated by the salt injection. As proven in the results of the conductivity and salt injection tests, AXR premium performance has extended the application range of 2-wire mags. AXR can be used in process control loops in the chemical industry. The ADMAG AXR 2-wire magnetic flow meter can be installed in the 2-wire system without any AC power source, thus drastically reducing the initial instrumentation cost, and power consumption. The power consumption of 2-wire type is only 1-4% of that of 4-wire type, and contributes to the operation cost reduction. In addition, over 96% reduced power consumption contribute to the life time energy saving and reduce the carbon foot print.